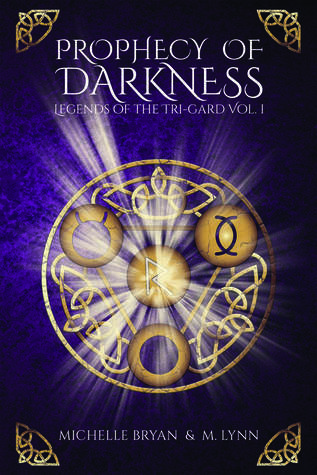 Prophecy of Darkness is an exciting adventure that I recommend to all who love YA fantasy. Michelle Bryan and Michelle Lynn have created a world where magic, scheming, betrayal, courage and love collide. After a slow start, the story gathers momentum and from the there one, it's a wild ride. Trystan is the Toha, prince, and protector of the Dreach-Sciene. His people are suffering, without magic, they are all facing starvation and war. The only thing that can save them is to restore the Tri-Guard and bring back the magic. He sets out on the dangerous journey with his second-in-command Davi, his sister Princess Rissa and their party is completed with traitors daughter, Alixa. These four young hopes of the Dreach-Sciene face many perils, but they bravely continue on their path because they are the ones who can forestall the darkness taking over. Prophecy of Darkness is well-written fantasy with interesting characters and very unexpected plot twists. Sign into Goodreads to see if any of your friends have read Prophecy of Darkness.